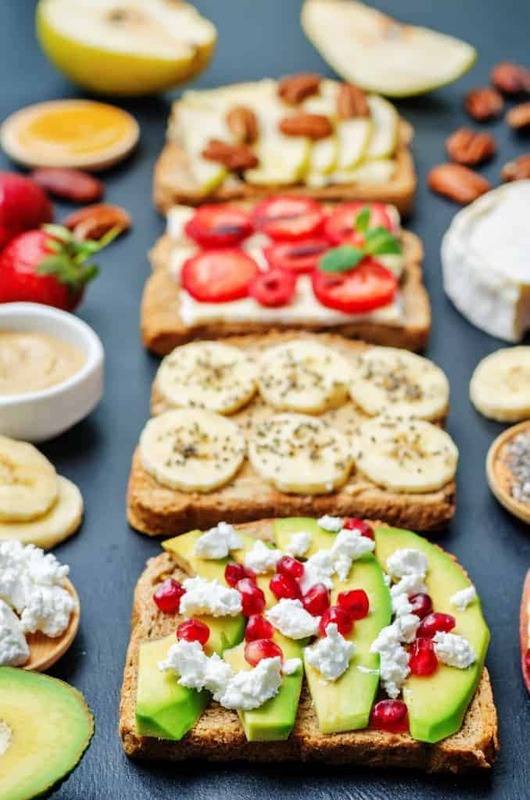 Most people think of toast as a breakfast food, but it can be a great snack staple anytime of the day. Don’t get me wrong though, I still love the traditional butter and strawberry jam combo in the morning. And when I need a little sweetness to start my day, there’s nothing like cinnamon sugar on toast–something my mom always did for me when I was young. But it’s time to branch out and look at some new possibilities for toast toppings. Whether you like fruit, cheese, peanut butter or nuts, almost anything can be used to upgrade your toast. I like to start with whole wheat toast as a base, but you can certainly stick to traditional white bread, or even get creative with sourdough or Italian. That’s the beauty of this idea–you can do whatever your heart desires. Between the almond butter and chia seeds, this toast delivers the protein, fiber and healthy fats you need to fuel your morning. Salty cheese is balanced out by the sweetness of apples and honey–with chopped pecans added for a bit of crunch. Balsamic vinegar is so good when paired with berries. If you have the time, roast the strawberries first and sprinkle some freshly ground pepper over the toast before serving. This combination has been everywhere lately, and with good reason: it’s simple and delicious. If you’re craving something savory, this toast is sure to please. While this toast might taste like dessert, it’s full of protein, fiber and antioxidants, so you can snack on it guilt-free. Leftover veggies from last night’s dinner make a fantastic topping for toast, especially when paired with fresh herbs. We couldn’t leave out avocado, could we? Heirloom tomatoes are in season for just a little while longer and this simple ingredient combination really lets them shine. Basil adds a little bit of sophistication to the classic combination of berries and cream cheese. This Mediterranean-inspired toast is perfect for an afternoon snack–it’s filling enough to keep you satisfied, but not so filling that you won’t have an appetite for dinner. Holy crap, yes please! I wanna taste every one! Just enter the username and then generate free unlimited clash royale gems as well as golds also. Thank you for posting this interesting combo toast recipe. I like it. Thank you, Laura Wood, I really love reading this article. These combos sound soooo amazing!! I really need to get some toast! !